NASA-funded researchers are monitoring a big event in our planet’s atmosphere. High above Earth’s surface where the atmosphere meets space, a rarefied layer of gas called “the thermosphere” recently collapsed and now is rebounding again. The collapse happened during the deep solar minimum of 2008-2009 - a fact which comes as little surprise to researchers. The thermosphere always cools and contracts when solar activity is low. In this case, however, the magnitude of the collapse was two to three times greater than low solar activity could explain. “Something is going on that we do not understand,” says Emmert. The thermosphere ranges in altitude from 90 km to 600+ km. It is a realm of meteors, auroras and satellites, which skim through the thermosphere as they circle Earth. It is also where solar radiation makes first contact with our planet. The thermosphere intercepts extreme ultraviolet (EUV) photons from the sun before they can reach the ground. When solar activity is high, solar EUV warms the thermosphere, causing it to puff up like a marshmallow held over a camp fire. (This heating can raise temperatures as high as 1400 K-hence the name thermosphere.) When solar activity is low, the opposite happens. Lately, solar activity has been very low. In 2008 and 2009, the sun plunged into a century-class solar minimum. Sunspots were scarce, solar flares almost non-existent, and solar EUV radiation was at a low ebb. Researchers immediately turned their attention to the thermosphere to see what would happen. These plots show how the density of the thermosphere (at a fiducial height of 400 km) has waxed and waned during the past four solar cycles. Frames (a) and (b) are density; frame (b) is the sun’s radio intensity at a wavelength of 10.7 cm, a key indicator of solar activity. Note the yellow circled region. In 2008 and 2009, the density of the thermosphere was 28% lower than expectations set by previous solar minima. Credit: Emmert et al. (2010), Geophys. Res. Lett., 37, L12102. How do you know what’s happening all the way up in the thermosphere? Emmert uses a clever technique: Because satellites feel aerodynamic drag when they move through the thermosphere, it is possible to monitor conditions there by watching satellites decay. He analyzed the decay rates of more than 5000 satellites ranging in altitude between 200 and 600 km and ranging in time between 1967 and 2010. This provided a unique space-time sampling of thermospheric density, temperature, and pressure covering almost the entire Space Age. In this way he discovered that the thermospheric collapse of 2008-2009 was not only bigger than any previous collapse, but also bigger than the sun alone could explain. One possible explanation is carbon dioxide (CO2). When carbon dioxide gets into the thermosphere, it acts as a coolant, shedding heat via infrared radiation. It is widely-known that CO2 levels have been increasing in Earth’s atmosphere. 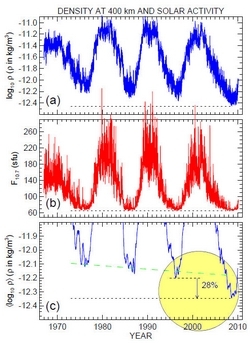 Extra CO2 in the thermosphere could have magnified the cooling action of solar minimum. An NCAR video shows how carbon dioxide warms the lower atmosphere, but cools the upper atmosphere. According to Emmert and colleagues, low solar EUV accounts for about 30% of the collapse. Extra CO2 accounts for at least another 10%. That leaves as much as 60% unaccounted for. In their GRL paper, the authors acknowledge that the situation is complicated. There’s more to it than just solar EUV and terrestrial CO2. For instance, trends in global climate could alter the composition of the thermosphere, changing its thermal properties and the way it responds to external stimuli. The overall sensitivity of the thermosphere to solar radiation could actually be increasing. Important clues may be found in the way the thermosphere rebounds. Solar minimum is now coming to an end, EUV radiation is on the rise, and the thermosphere is puffing up again. Exactly how the recovery proceeds could unravel the contributions of solar vs. terrestrial sources. “We will continue to monitor the situation,” says Emmert. More information: Emmert, J. T., J. L. Lean, and J. M. Picone (2010), Record-low thermospheric density during the 2008 solar minimum, Geophys. Res. Lett., 37, L12102.